Wal-Mart, America's largest retailer, is looking at going greener, with the opening of additional energy efficient stores this year in Arkansas and Missouri, a move that underlines that solar and wind power are quickly moving into the mainstream. Although it is only midway through a three-year experiment that looks at more environmentally conscious store designs, Wal-Mart Stores Inc. has already started adapting some of the economically viable technologies to the company's new stores. In January, the Bentonville, Arkansas-based discount retailer opened the first of a line of "high-efficiency" Supercenters in Kansas City, Missouri that uses 20 percent less energy for refrigeration and heating and cooling. It expects to open another in Rocklin, Illinois, later this spring. "We are learning a tremendous amount from our experimental stores," says Eric Zorn, president of Wal-Mart Realty in Bentonville. "Wal-Mart stores are already some of the most energy-efficient in the retail industry, but we want to take efficiency even further. This new Supercenter is where we really get to put what we've learned into practice." The move toward more energy-efficient store designs may make economic sense to Wal-Mart, but it also sends a message to all big-box retailers and the solar industry. "I think the most meaningful takeaway from the project is you don't get any more mainstream, cost-conscious and potentially large market-impact customer than Wal-Mart," says Marc Roper, vice president of sales and marketing for Schott Solar Inc. in Roseville, California. "The fact that these guys are considering this says the market acceptance of the technology, like photovoltaics, is really moving into the mainstream. "There's definitely a strong interest in these types of technologies in general. Our company has installed a lot of systems for commercial retailers." Wal-Mart opened two experimental Supercenters in 2005--one in Aurora, Colorado, a Denver suburb, and the other in McKinney, Texas, about 30 miles north of Dallas. The stores are part of a much larger program through which Wal-Mart intends to cut energy use at its 7,000 stores by 30 percent and greenhouse-gas emissions by 20 percent within seven years. As part of this effort, the giant retailer has promised to invest $500 million annually in energy-saving technologies. The McKinney store is expected to generate about 55 kilowatts through various solar technologies. Although the amount pales compared with large commercial projects that may produce 500 kW or power plants that may generate into the megawatts, it still is significant for Schott Solar, Roper says. "If you measure this differently, this is a pretty important installation because it's a company like Wal-Mart that is evaluating all of the technologies," he says. "It's a very important installation for us. Even though it isn't the largest in terms of power output, it could potentially be the largest if you aggregate all of the Wal-Mart facilities." 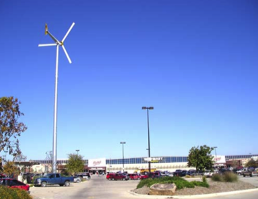 The 206,000 square-foot McKinney Supercenter features a variety of environmentally friendly technologies, ranging from special parking lot pavement that allows water percolation to three types of solar panels and a wind turbine. Both stores use LED lights in exterior signs and in grocery, freezer and jewelry cases instead of fluorescent strip fixtures. Wal-Mart spent about $30 million to develop the system--which uses light-emitting diodes--with General Electric and Philips Electronics. In-store lighting uses the T5H0 high-output linear fluorescent lamps, which are about twice as efficient as the T8 lamps used in other Wal-Mart stores. A typical Supercenter uses about 1.5 MW of energy annually. Wal-Mart expects the Aurora facility will be 20 percent more energy efficient than a conventional Supercenter and the McKinney store is designed to be 10 percent more energy efficient. 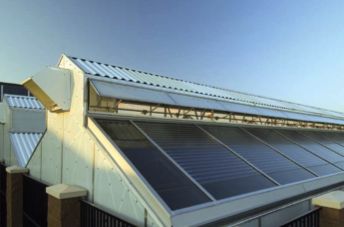 The 206,000-square-foot Aurora store also features three types of solar panels on the roof--polymer-encased amorphous PV laminates from United Solar Systems of Troy, Michigan; single crystalline PV glass and plastic laminates from PowerLight of Berkeley, California, and edge film growth PV glass models from Schott. In addition, the Colorado store uses evaporative cooling, which involves water sprayed into an air stream to cool the air as it evaporates. Air distribution system ducts are mounted 11 feet above the ground. The 206,000-square-foot McKinney Supercenter features a smorgasbord of 26 environmentally friendly technologies, ranging from special parking lot pavement that allows water percolation to three types of solar panels and a wind turbine. Thin-film and crystalline PV laminates from Schott Solar have been integrated into the south-facing entry facade. They've also been used to create the signature blue Wal-Mart stripe across the front of the store. The facade-mounted crystalline panels are estimated to produce 23,544 kWh per year. Thin-film PV laminates--also from Schott Solar--have been integrated into the roof of the entry vestibules. Each vestibule is estimated to generate 4,177 kWh per year. To allow sunshine into the Garden Center, polycrystalline PV laminates from Schott Solar were integrated into the canopy. The fingernail-thin wafers are mounted between glass and plastic. The system is expected to generate 14,585 kWh per year. Roper says Schott used to produce the crystalline products, but quit because of low demand. The company brought them back for the Wal-Mart project. Despite their lack of popularity, the polycrystalline panels are twice as efficient as the thin-film technology. "Generally, the multi-crystalline is 12 to 13 percent efficient, and the thin film is six percent efficient," Roper says. A third solar technology--peel-and-stick thin-film photovoltaic laminates from Solar Integrated Technologies of Los Angeles--was mounted on the roof of the Tire and Lube Express. They're expected to produce 5,710 kWh per year. Robert Erb, project manager for Solar Design Associates, says incorporating so many types of solar into one project is unusual and slightly more difficult than just using one. But he credits the store's general contractor, Turner Construction of Sacramento, California, and project manager Tom Kempen in Dallas for smooth sailing. And integrating solar into a building design, rather than mounting panels on a roof, is more costly, Erb says. "It's definitely more expensive than if they did things the other way," he says. "But building-integrated photovoltaics do provide the opportunity to offset some of the cost of the PV by eliminating the material you would buy to cover that area in the first place. 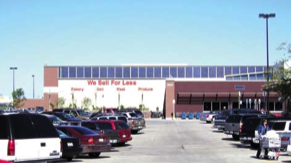 "Erb says most big-box stores don't have the glass entryways or roofs like the McKinney Supercenter and would lend themselves to more cost-effective rooftop solar installations, similar to the Aurora Supercenter's. The Harvard, Massachusetts-based firm designed the solar applications for both the McKinney and Aurora Supercenters. in the past somebody who was manufacturing tofu in Northern California might do." After one year, Wal-Mart issued a report card on the two stores that highlighted which technologies were the brightest economically and which ones faced initial challenges. The company will continue to monitor and evaluate the two stores throughout the three years. It also has enlisted the National Renewable Energy Laboratory (NREL) in Golden, Colorado, to monitor progress at the Aurora store. Part of NREL's job is to compare energy use at the experimental store with that of a conventional Supercenter in nearby Centennial, Colorado, during the three years. Oak Ridge National Laboratory in Oak Ridge, Tennessee, will conduct a similar study that compares the experimental store with an existing Wal-Mart in McKinney. Among the technologies Wal-Mart has already begun integrating into new Wal-Mart stores, Supercenters, Neighborhood Markets and Sam's Club stores nationwide are motion-sensor-driven LED lights. Sensors turn off the lights in freezer and medium-temperature refrigerated cases when not in use for a few seconds and quickly turn them back on when a customer approaches. Based on data from the two experimental stores, Wal-Mart says it expects the technology alone will reduce energy use two percent to three percent in each facility. The high-efficiency stores also borrow from heating and cooling experiments at the two Supercenters. The new HVAC and refrigeration systems are fully integrated so that 100 percent of the waste heat from the refrigeration system is reclaimed and converted into usable energy. The company also plans to use evaporative cooling, similar to that in the Aurora store, in new stores in specific markets. Although wind turbines in Aurora and McKinney faced mechanical problems during the first year, Wal-Mart hopes they're now solved and the units continue to hold promise, according to the report card. It says wind generation is still in the testing phase. Solar power generation also faced challenges at both experimental facilities. Electric meters on the McKinney solar installations caused faulty readings. Solar generation during the spring and summer at the Aurora store proved most successful.